Charming, south facing villa set in a large well kept garden with lawns enclosed by trees. Private pool with terraces with garden furniture. The villa has a cosy "bodega", where you can have a fresh drink. There are 2 double bedrooms with bathrooms and one with single beds, a living-dining room with satellite TV. From €600 to €1400 per week. Holiday villa situated in the peaceful urbanizacion Costa Nova, with private pool and 800 sq.m. garden. Several beaches within easy reach. Sleeps 4/6. From £450 to £650 per week. SPACIOUS VILLA SITUATED ON THE MONTGO MOUNTAIN, WITH PRIVATE TENNIS-COURT & POOL. Villa Casa Ladera sits below Montgo mountain with views across the valley. The villa boasts it's own private tennis court and a swimming pool with large sun bathing terrace. 6 bedrooms, modern kitchen and furnished to a very high standard. Sleeps a maximum of 12 people. From £900 to £2100 per week. Magnificent Villa with 9 bedrooms and 8 shower rooms, sleeps up to 18. Home cinema room, pool table, air hockey, table tennis, BBQ, large private swimming pool, close to Arenal beach Javea. 3 self contained apartments. From £2790 to £3690 per week. Los Arcos is a 2 bed Costa Blanca holiday apartment in private villa in La Nucia near Altea (8km) and Benidorm (5km). It has its own pool, garden with fruit trees, bathroom, kitchen, barbecue, TV and outside seating. The 2 double/twin rooms sleep 4 people and there is a convertible sofa for a fifth. The beaches of Benidorm and Alfaz del Pi are only 5km. From £320 to £725 per week. Detached holiday villa on large corner plot with spectacular views of the sea and mountains. Private pool, jacuzzi, mini-gym. Set on 2 levels with 4 beds and 3 bath. Fully equipped kitchen, dining area and lounge. Price includes use of leisure facilities in nearby hotel complex. From £550 to £1400 per week. Holiday Villa set on 2 levels with 3 twin bedrooms, 1 en-suite. All rooms decorated and furnished to the highest standards. Luxurious floodlit private pool with roman steps. Villa forms part of a superb site called Villotel and hosts tennis courts, mini golf, a very large community pool and its own restaurant. From £650 to £1500 per week. SPACIOUS LUXURY PRIVATE VILLA, WITH PRIVATE POOL. Holiday villa with 6 bedrooms, private pool, large comfortable lounge/dining room with American style kitchen. 5 minutes drive from Arenal beach. From €1960 to €2710 per week. HOLIDAY VILLA WITH PRIVATE SWIMMING POOL CLOSE TO BEACH. Situated in a quiet garden city in a peaceful area occupied by many private villa owners. This charming holiday villa, is set in a large, well kept garden. It has multi-layered sun terraces including a large terrace with swimming pool, an outside kitchen and BBQ. Upstairs, it has 2 double bedrooms, the downstairs apartment has a further double bedroom. From €580 to €880 per week. Holiday villa rental with panoramic views in Benissa situated in the peaceful urbanizacion Costa Nova, with private pool and 800 sq.m. garden. Several beaches within easy reach. Sleeps 4/6. From €340 to €1200 per week. This wonderful, well maintained holiday villa is situated in a peaceful location right by the sea with its own access to a small, quiet, sandy beach. It is set in a large well kept garden with many Mediterranean plants, palms and cacti. It has a large pool and several graduated terraces with magnificent sea and panoramic views. 2 double bedrooms, one with an extra bed. From €295 to €755 per week. 3 bed 2 bath Moraira villa, sleeps 6, fully equipped kitchen. The villa is spacious, well furished all as new, beautiful gardens and private pool, close to beach and amenities, sports and shops etc. From £490 to £1400 per week. Holiday villa in Moraira. The atmosphere surrounding this villa mirrors an old colonial ambience. The villa is well surrounded by large covered verandas providing shade. The front veranda is furnished with teak dining table, various benches and plants to enjoy al fresco dining. 3 Bed Villa, sleeping 6-8 people, with large private pool in quiet residential neighborhood. From £1,000 to £1,200 per week. VILLA WITH PRIVATE POOL CLOSE TO BEACHES. AVAILABLE AS A WHOLE, OR 3 INDIVIDUAL APARTMENTS. SLEEPS 10. A large holiday villa set in terraced gardens with lemon and orange trees. It has a swimming pool sunbathing areas, barbecue, eating terraces and balconies. There is also a second villa available for up to 7 persons - see main page for details. From £310 to £850 per week. 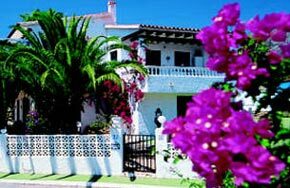 Costa Blanca holiday villas, holiday homes, apartments and vacation rentals in Costa Blanca, Moraira, Javea, Altea, Benissa, Benidorm, Calpe, Spain. 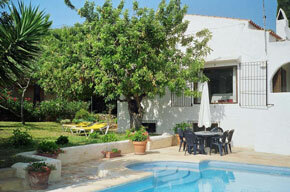 Spanish villa holidays and vacation rentals direct from owners. Costa Blanca Holiday Homes offer good value self catering Spanish accommodation in one of the most popular areas in Spain with a wide variety of scenery, mountainous backdrops, fine sandy beaches and the Mediterranean Sea.